All it takes is one person or one conversation to prevent a tragedy, and when it comes to suicide experts say it's even more necessary. What happened Thursday morning could shake any parent to their core. It brings up the harsh reality and seriousness of suicide among teens and adults in Las Vegas, and across the nation. “So many times parents blame themselves for not seeing the signs, seeing the symptoms, but this is not a blame game, this is where we just need to start listening to our kids,” said Dr. Beth Creel, a certified grief and recovery specialist. 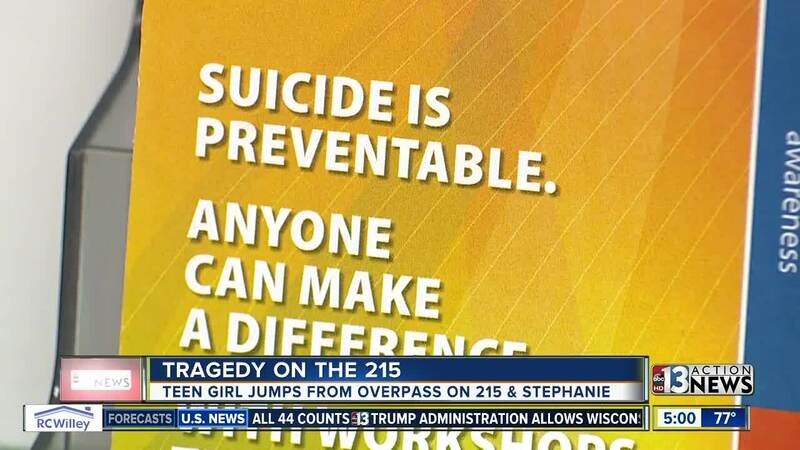 She says when it comes to teen suicide prevention, parents must do all that they can. Looking out for things like change in weight, mood swings, alcohol, and drug use, or even something a simple as a change in who they spend time with. “Changing in their social circles, suddenly they start to feel their friends are not really their friends or their second-guessing friendships," said Creel. According to the Nevada Office of Suicide Prevention, Nevada has the 24th highest suicide rate for youth in the country for anyone 17 years old or younger. In the state, suicide is the 2nd leading cause of death for those ages 10 to 24. Overall, suicide is the 8th leading cause of death in Nevada. The state also has we have the 5th highest suicide rate in the country. In the Las Vegas valley, there are programs working to let teens know there's help out there. At the Office of Suicide Prevention near Charleston and Valley View Boulevards, education and prevention training is at the top of the list - working with the Clark County School District and the Boys and Girls Club to educate students on who to reach out to when they need help. “We want to teach the youth to acknowledge that a friend is going through a life crisis, or themselves are going through one and acknowledge that they are in that place that they need help,” said Richard Egan. If someone is showing signs of depression or needs help the National Suicide Hotline can be contacted at 1-800-273-8255.